The deadly adventures of Bunnyman continue in the third and final film in the BUNNYMAN trilogy that began with BUNNYMAN (a.k.a. The Bunnyman Massacre) in 2011 followed by BUNNYMAN 2 (a.k.a. The Bunnyman Resurrection) in 2014. The man known as Bunnyman returns home to find his family running a haunted house attraction. The family welcomes him home, but soon realizes you cannot domesticate a wild animal. Death and mayhem ensue as the family turn on one another to fulfill their bloodlust. From writer-director Carl Lindbergh, and starring Diana Prince (Puppet Master: Axis Termination), Debby Gerber (“Glee”), and Marshal Hilton (The Bunnyman Massacre). 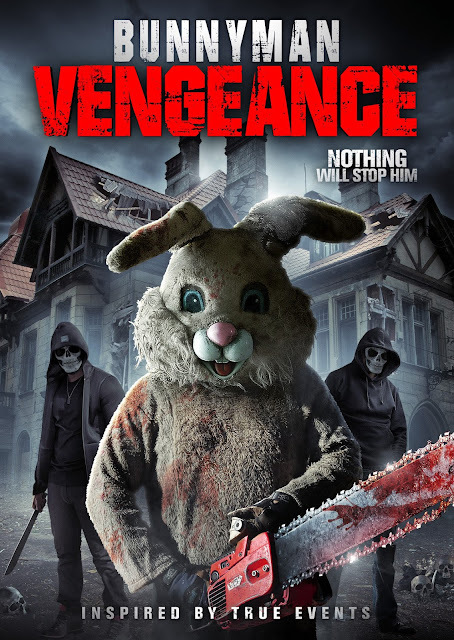 BUNNYMAN VENGEANCE escapes the bloody burrow on digital 20th October 2017and DVD/BD on 21st November 2017 from Uncork’d Entertainment.